Nature's View is our beautiful newly remodeled upscale house with a private heated pool on Estero Island - Fort Myers Beach, Florida. Our house is perfect for couples, families, and family reunions. Our house is located mid island and is on a quiet residential neighborhood street. Our property abuts the Mantanzas Pass Nature Preserve, a 56-acre Natural Habitat Park with walking trails and several stops where one can sit and enjoy the beauty of the back bays and watch the dolphins at play. Our house is right next to the City park with a large heated pool and pool slides and tennis courts. Our property has beautiful tropical foliage and live oak trees. The beach is a short one and one-half block (1200 feet) walk away. 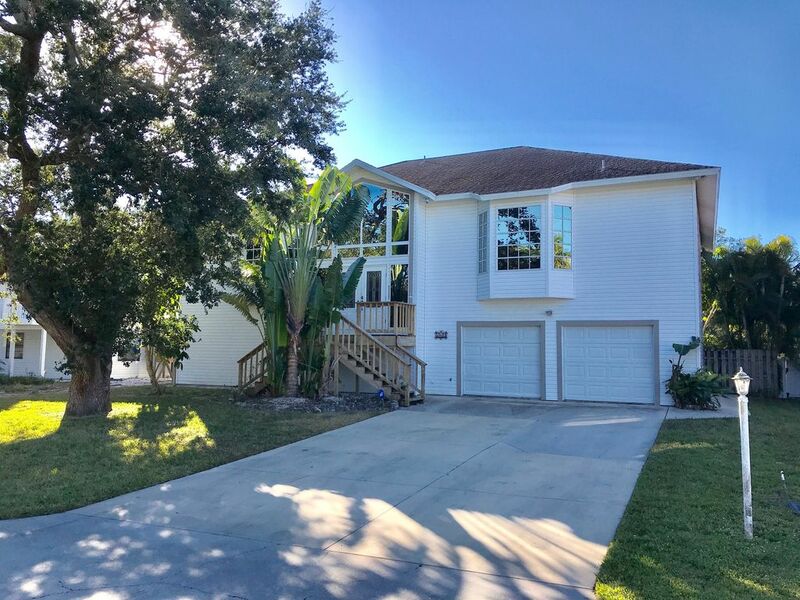 Our five-bedroom three-bath home has just been remodeled with a completely new kitchen including cabinets, granite counter tops and all new stainless appliances. There is new tile floor throughout the house and the bathrooms have been remodeled with new vanities, faucets and deocorations. There is new furniture and bedding throughout the house. All TV's Are HD TV's with digital cable and high speed wireless internet. The house has a large master suite with a king-size bed, large closets, and a HD TV. The master bathroom has a large double shower and 'his and hers' sinks. There are two smaller bedrooms, one with a queen-sized bed, the other twin beds; and each room has a small loft with a twin bed for the kids. The kitchen has just been remodeled with all new modern stainless appliances including a refrigerator, dishwasher, microwave, stove/oven, coffee maker, toaster, blender, silverware, dinnerware, spices, and all the gadgets you'll need whenever you're cooking in. We also have a gas grill for outdoor cooking. There is a large formal dining room with tables and chairs. If you prefer to dine out, there are many restaurants within walking distance including a pancake house and a Chinese restaurant. The living room has very comfortable furniture, as well as a 55-inch HD TV, cable TV, a blu ray DVD player. There is a queen size sleeper sofa. There is a second large family room with comfortable seating and HD TV with a blu ray DVD player. The back portion of the family room has a room divider and another king size bed. The house has a large recreation game room area with a bunk bed with trundle (three twin beds), a day bed (two twin beds) and a large HD TV and a foosball table. There is a second master bedroom with a king size bed and HD TV. A large balcony with seating areas overlooking the pool and dining tables for outdoor eating are just off the dining and living room areas. The balcony has a stairway leading down to a private, full-size heated swimming pool. There is an assortment of pool floats and toys for your use and enjoyment. The backyard is surrounded by large trees; and it abuts the nature preserve. The yard has a wooden fence for privacy. The private pool and lanai area has a large pool deck and a full size heated pool. Beach chairs and chaise lounges are provided as well as several tables and chairs for seating and to enjoy outdoor cooking at the Weber bar b que. There is a covered porch area for escape from the sun with a fan. There are some pool toys available. You provide the tropical drinks. Additional amenities include central air-conditioning and heating, a full-size washer and dryer, along with bed and bath linens. Beach chairs and beach towels are available for you to use. There are wagons and coolers on wheels provided to get your things to the beach. The beach is a short one to two minute walk from our house. There are restaurants and beach activities such as parasailing and banana boat rides within a short walking distance (two blocks). The downtown Times Square entertainment distict is only a 1/2 mile walk or drive from our house. There you will find many excellent outdoor restaurants and bars, both gulf side and on the back bay. There is an information book in the house which provides information on what to do, where to go and best restaurants. The free beach trolley stops in front of our house. The Bay Oaks Recreational Facility is just one-half block away and offers tennis courts, basketball, and a large community swimming pool with water slides and lifeguards for the kids. All of these activities are within walking distance of our house. Please call for more information. To assure your reservation, please reserve our house now. Holiday weeks go quickly. Our house is a short one block walk to the beach. The dining room Table seats 8. There are several other tables on the balcony off the living room and on the pool deck. The city pool is a short one block walk. A large pool with water slides. Pleasantly surprised by how BIG this house really is--and it sleeps so many comfortably. We really wanted for nothing. Everything was well kept up and everything was as promised in the description. The outdoor areas were great and the walk to the beach was a piece of cake as well. The owner was also extremely responsive and accommodating to our requests. Would definitely recommend this property and hope to use it again someday! Truly enjoyed are stay at this location. Home was exactly as described. Excellent location near beach and tram stop to local attractions. David is great to deal with and very responsive to our questions and needs. Will definitely consider again for next year!! Thanks for your kind review. We look forward to your return next year. Fantastic location & beach access for reunion of 11. Property clean. Great location to beach access across Bay St. Beach chairs, beach towels & wagons to get them there 5 min. walk. Great up scale kitchen & livingroom area. Chairs for 8 at dining table. Chairs for 12/3 tables at pool. Drawbacks: Many sleepers on lower level had no bathroom which meant stairs to climb through foyer in middle of night to bathroom. Humidifier needed in lower level/musty smell. Some had difficulty with internet access. 3 Bedrooms/baths on main level, very good. Laundry excellent. Nice deck over pool. Trash bins easy to access. Thanks for staying with us and thanks for input. We did put in a dehumidifier. We had had a lot of rain lately with high humidity but rainy season now over and dried out. We called Comcast and they came and adjusted the internet. Hope to see you back next year.. Tons of beds and great community space! We went for a long weekend and David was very accommodating. The place is not far from the beach and we walked everywhere. Unfortunately we spent so much time enjoying the pool that we barely went to the beach. It was just so convenient walking outside and being in the sun at the pool! Would stay there again! Great big family gathering setting. Great space for a large family with a great kitchen. Close to the beach but away from noise and crowd. Would return !! Sunsets amazing. Nature's View is our beautiful newly remodeled upscale house with a private heated pool on Estero Island - Fort Myers Beach, Florida. Our house is perfect for couples, families, and family reunions. Our house is located mid island and is on a quiet residential neighborhood street. Our property abuts the Mantanzas Pass Nature Preserve, a 56-acre Natural Habitat Park with walking trails and several stops where one can sit and enjoy the beauty of the back bays and watch the dolphins at play. Our hose is right next to the City park with large heated pool and pool slides and tennis courts. Our property has beautiful tropical foliage and live oak trees. The beach is a short one and one-half block (1200 feet) walk away. Our house is a short 1/2 mile walk to the Times Square Entertainment District where you will find many outdoor restaurants and bars. At sunset pier you will find local comedians and entertainers as you watch some of the most spectacular sunsets in the world. You can fish off the pier with the local fishermen. You can also take a sunset cruise on a sailboat or a pirate ship.